Posted May 13th, 2011 by Karl & filed under Case Studies. At MailBigFile we want all our customers to be happy with the service they receive. 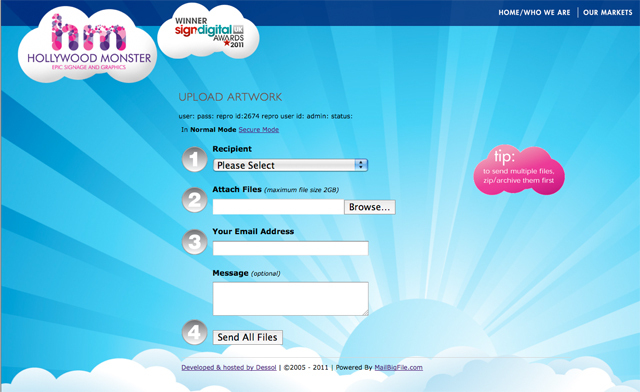 This is not limited just to the cloud server that we offer, we want you to be happy with the presentation of your pages. This is why we want to allow our business customers as much control over their send and receive pages as possible. As one of the largest graphics solution businesses in the Birmingham region, Hollywood Monster require the ability to receive large files from clients safely and securely. With MailBigFile, they get exactly that. Then, when they want to add some extras to their service (background transparency, changing the tip box picture) we provide this feature for them. Please click here to see how this looks on their webpage. “I have to say, I am very impressed with the customer service and speed at which you have sorted this for us – thank you very much. Looks so much better now.” – Louise, Hollywood Monster. If you’re interested in getting something similar for your website, or are just interested in hearing what options are available to you, you can either mail us or call on +44 1502 588 885 for a quote.